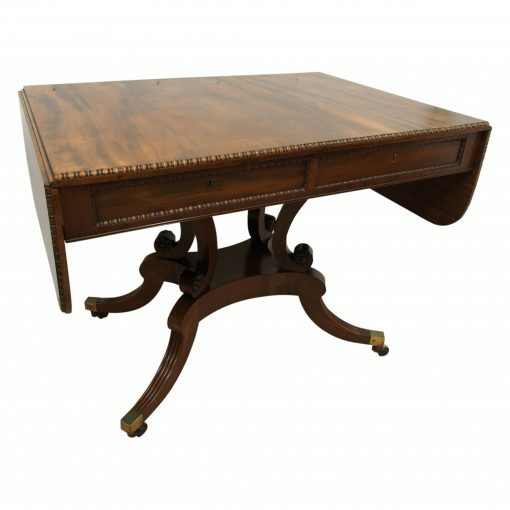 Circa 1815, classical Regency sofa table by William Trotter of Edinburgh. 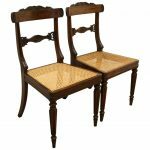 With a rectangular shape and flame mahogany top, the 2 ends are rounded. The fore edge of the table has a sunken beading which continues down into the leaves and all around the back. Beneath the top there are 2 drawers, 1 dummy and 1 real on each side and the escutcheons on the locks are gilded and simple. The drawers have quarter beading which is a classical Trotter feature and retain their original steel and brass locks. A thin apron has a small ribbed beading below, finishing the front section and underneath the table top are 4 sabre uprights which finish in a turned section to the back and base. There are 2 carved flower heads at each side, again frequently used by William Trotter. These 4 uprights sit on a raised platform with concave front and sides and are veneered on the top and the sides. 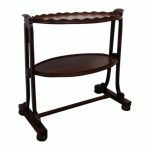 There are 4 elegant, reeded and sabre legs in solid mahogany, finishing on 4 cast brass blocks and brass castors beneath. This table has wonderful colour and patination, all the classical features of William Trotter, Edinburgh furniture of pieces from 1815.